An excellent example of how Shorn + Associates, Architects approach the reconstruction/ restoration of a historically significant structure is to follow a path which begins with basic research and in-depth dialogues with the client. 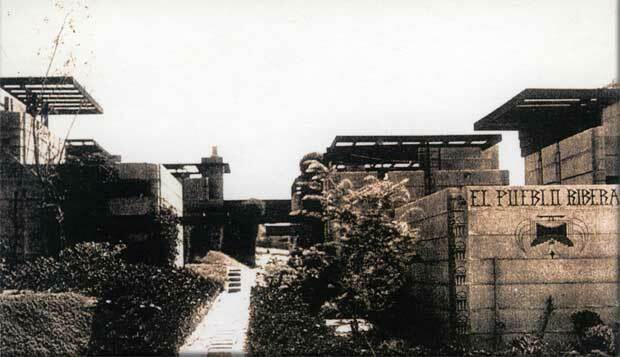 This particular project, known as El Pueblo Ribera, is by master architect Rudolph M. Schindler. We were fortunate to discover the original drawings of the architect, which are kept in the archives of the University of California at Santa Barbara. In 1923 Rudolph M. Schindler designed a twelve-unit residential court complex in La Jolla. The original design by Schindler demonstrates a uniqueness of enclosure, a flowing interpenetration of space, the conscious and exotic use of natural light and the successful integration of a southwestern style of architecture, with the functional requirements of the 1920's. In addition, El Pueblo Ribera foreshadowed the use of a building material (concrete), a construction process (slip form), and architectural details (sliding redwood doors and a modular grid) that would not come into common use for many years. The reconstruction of unit #7 of the complex, which was destroyed in an arson related fire in 1991 addresses both the present client's needs and reinforces all the key aspects of the original design: its spatial relationships and physical elements of redwood and glass sliding doors, overhead clerestory windows between the floor joists, and horizontally formed in-place concrete walls. The proportions of concrete scoring, corner quoin-like detailing and window mullion modulation have all been recreated to ensure that the sum of the parts of the new structure convey the intent of the original Schindler design to make it a compatible neighbor with the other units. It is clearly evident that this is a new structure within an older historic residential district context. The breadth and goal of our firm's scope of historic preservation architectural services in San Diego, is based on The Secretary of the Interior's Standards for the Treatment of Historic Properties, as well as conformance with the State of California Historic Preservation Guidelines, which includes the standards for preservation, rehabilitation, restoration and reconstruction of historic structures. The preparation of design and construction documents for additions to recognized historic buildings are based on these standards. Additionally we offer to our clients the ability to prepare building research reports for submission to national and local historic regulatory and advisory bodies such as the National Park Service, State of California Office of Historic Preservation, and the San Diego Historic Resources Board to name a few. We also coordinate presentations with our clients for their historic properties with local historic preservation groups and boards throughout La Jolla. The La Jolla / San Diego region has a rich heritage in historic preservation of its built and natural environment. This permits our communities to know where they've been, where they are and where they are going in their design and planning, in order to retain the vibrant quality of these communities. Jeffrey D. Shorn + Associates, Architects have taken an active part over the past 25 years in the San Diego historic preservation and adaptive reuse of our built environment and have received several awards for their contributions.